Production only 9,000 bottles/year from 2.5ha vineyards, paradise in Montalcino. IL PARADISO DI MANFREDI produces 9,000 bottles annually between Brunello, Rosso and Riserva. These wines come from Sangiovese cru grapes in purity. There are 7 different parcels in the vineyards and mixture of all these parcels generates energy of wine. The difference between Rosso, Brunello and Riserva is ageing period in casks. Quality of grapes are same for 3 cuvees. This ageing process makes big difference. Their work values the typical nature of the soil of IL PARADISO DI MANFREDI and the naturalism and the integrity of the wines. In the vineyards, they never use chemical and insecticide since beginning(1950). So the vineyards are perfectly natural and healthy. In the process of wine making, there is no clarification, no filtration and no acidification. Everything is done by non- interventionism. 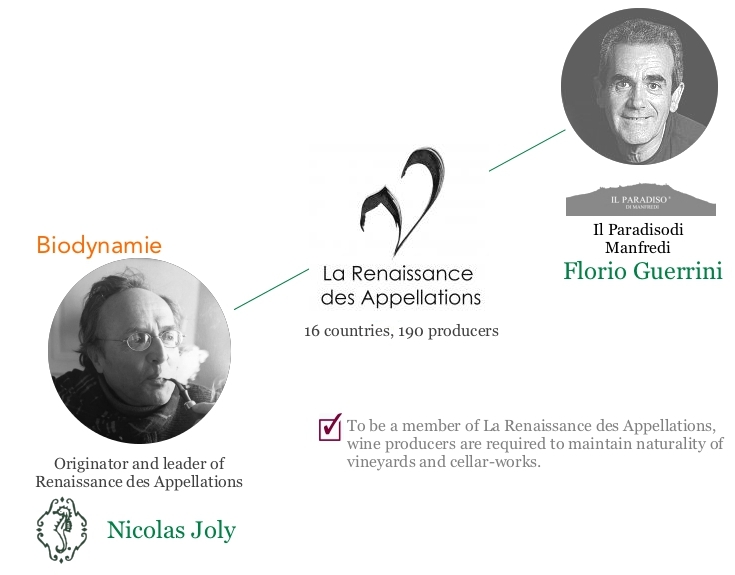 IL PARADISO DI MANFREDI is a member of La Renaissance des Appellations which is organized by Guru of Biodynamie Nicolas Joly. To be a member of this group, wine producers are required to maintain naturality of vineyards and cellar-works under very strict rule and criteria. - Aged 4 years in the big (25/30hl) Slovanian oak cask. Production : 1,200 bottles, not every year. - Aged 3 years in the big (25/30hl) Slovanian oak cask. Production : 6,000 - 8,000 bottles /year. - Aged 1 years in the big (25/30hl) Slovanian oak cask. Production : 1,800 - 3,000 bottles / year. The vineyards of Sangiovese Grosso are placed on terraces, parallel along the hill of Montalcino, with varying altitudes (approximately 330 m. above sea level) and are exposed on the North/East side. The microclimate, the composition of the terrain and the care IL PARADISO DI MANFREDI takes with the vineyards give the grapes unique properties and balance. The wines IL PARADISO DI MANFREDI produces are different every year and are interesting because we ensure that the ground can express its own individuality naturally. The total surface of the vineyards is 2.5 hectares, of which 2 produce Brunello. The vines are cultivated using a spurred double cordon. The planting area is 90 cm for 2.7 m with approximately 3,300 stocks per hectare. The average age of the vineyards is 28 years.